Actual Size: 22' x 19' x 13'2"
Outlets: 1 of 110 volts. 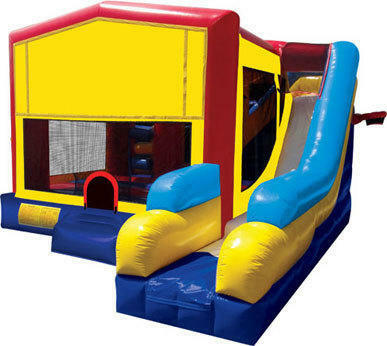 Rent a 5 in 1 combo for your next birthday party, company picnic, or special event. The Bounce House Combo is a big hit for boys and girls. Children can bounce, go through horizontal and vertical obstacles, play basketball, climb and slide!